This sample price: priced within the past 7 days for arrival on Saturday, November 23, 2019, departure from Los Angeles Intl, CA. Choose your own departure city and dates. 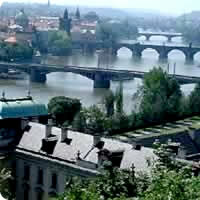 Take an adventure of a life time, journeying through Europe, starting in Czech Republic and ending in Croatia. Begin in Prague (the City of a Thousand Spires reflecting centuries of religious control dominate the skyline) and then take a train to Krakow (an important cultural, historical, educational and commercial center) and then hop a flight to Budapest (2 cities in one! ; Buda high on the hills and marked by the Royal palace and fortress and Pest, expansive flat on the opposite side of the river with modern shops and restaurants along the promenade) and then take another train to Zagreb (a vibrant destination with modern shops and fascinating museums). This is a flexible vacation package. Select your number of nights in each city, desired hotels and activities. "The country of a thousand islands," Croatia is situated on the Adriatic coast. It has a rich cultural and historical heritage, with many different influences - Greek, Roman, Celtic, Illyrian, Austrian, Hungarian, Byzantine and Islamic. The Croatian coast is among the most beautiful in the world having unique cities like Dubrovnik which was the rival of Venice for centuries, Split with its Diocletian palace, great beaches and more than 1001 islands to choose from. Besides its natural beauty, Croatia also offers: a great history, many museums and a unique mixture of cuisines.